Students from HSFP 2012 celebrate being done with their presentations. This week, the High School Fellowship class gave their final presentations on their semester-long research paper and illumination projects. It’s always exciting to see what they’ve come up with to present. Near the beginning of the semester, they’re given the parameters for their project: write a 5 page research paper on one of the 3 plays we’re studying, and create an illumination project to explore the theme of the paper further. Throughout the first few weeks, they have regular group sessions with members of our Division to flesh out their ideas, and edit down to a specific topic to cover. I learned a lot from them this year. I learned that the moon plays a heavy role in A Midsummer Night’s Dream – so much so that it’s mentioned in the first and last lines of the play, as well as every opportunity in between. I saw again that even though Rosencrantz and Guildenstern are seemingly disposable characters, they are variously represented in modern drama – for example, Laurence Olivier cut them out almost completely, while Tom Stoppard wrote an entire existential play about them. And I learned that the best dish to cure a phlegmatic humor is a spinach and wild-berries chicken salad. It’s wonderful to see high school students applying their passions to Shakespeare – neurology, cooking, dance, feminism, or even just get passionate about the plays themselves. We know that these are the kids who’ve, for the most part, “drunk the kool-aid,” but it’s no less invigorating when they share and show their love of Shakespeare through their own fresh perspectives. Have you experienced moments like this in your own class? Let us know! Once more into the planning stages for HENRY V! Folger Theater will soon start rehearsals for Henry V. The Folger Education team meets ahead of the rehearsal kick-off to brainstorm ideas for the study guide. We create a study guide for each of the Shakespeare plays that gets produced at the Folger and archive them on our study guide web page for teachers to use (minus the production specific material). We look at the lines of inquiry we want to pursue — any question that may come up when thinking about the play. And we consider what students should know about the world of the play, as well as themes presented in the play that may connect to students’ lives. Then we look at other works of art that we can connect to the play and think about activities that teachers can use to engage their students with the play before they come to see it. It’s actually a lot of fun — we laugh a lot, and there is a great deal of energy in the room as we bounce ideas off of one another. Anyway, we met today to begin planning for the guide to Henry V, and it occurred to me after our meeting that it would be great if teachers had the opportunity to work collaboratively on planning units of study, not just for teaching Shakespeare, but for teaching any work of literature. Are there any groups of teachers, or school districts that plan units together? If so, how do you arrange to meet? What’s the process you follow? For which plays have you prepared units of study? This was the opening message to all attendees at the National Council for Teachers of English conference. Teachers from all over the country assembled to attend sessions on the newest ideas for literacy, sample the latest online resources, pick up fiction and non-fiction hot- off- the- press and hear notable authors talk about their latest work. The organizers hoped that the teachers would return to their classrooms fired up with renewed enthusiasm and share all that they had learned from the exhibitions and presentations with their colleagues. Folger Education hosted a booth in the Exhibition hall where we met with over 3000 teachers. Many were diehard Folger fans who use our website regularly and were keen to hear about our latest resources, workshop offerings, webinars and teacher materials. We also signed up 400 new subscribers to Bard Notes, our electronic newsletter and provided swag such as our Quoting Shakespeare poster, “Let them play” buttons, Folger Education pencils and bookmarks which list all our web addresses on the back to all who stopped by. 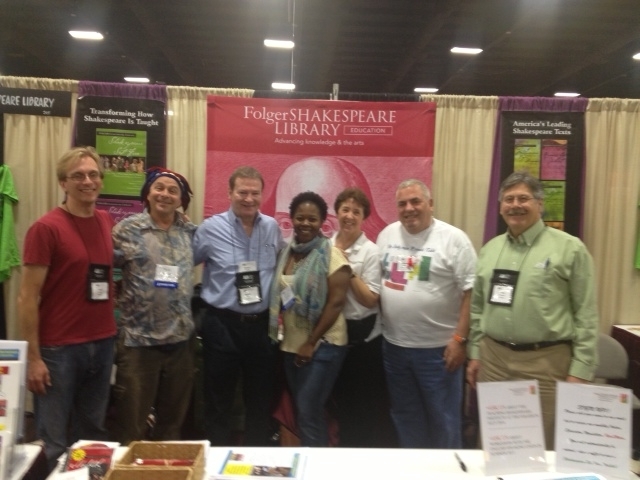 The booth was hosted by Folger Education staff and alums from the Folger Teaching Shakespeare Institutes. Folger Education also presented a series of sessions, Act 1 through 5 covering pre-reading, language activities, technology, film and video, and assessment tools. All the sessions were interactive and well attended. Lucretia Anderson, our Elementary Coordinator also presented a new session on teaching Shakespeare to students in grades 3 through 6. More than 580 attended our six sessions over the weekend! This was well received and promises well for the planned conference on this topic scheduled for June 2103. We’re looking forward to NCTE 2013, and hope to see you there! How Pro do you Go? Where are the costumes coming from? What props do we need? How can we set the scene? For our festival schools, we encourage a minimal amount of props and costumes – it’s easier to transport, and it doesn’t distract from the awesome language the students are performing! Shakespeare’s own company didn’t have sets to work on, and all of their costumes were donated upperclass clothes. Any props would have to be purchased (O, that shareholder money!) or made by the company. Shakespeare didn’t write in must-have props and costumes for his plays – but here and there he may offer hints. Is a character carrying a letter or a bag of money to give to someone else? Does one character refer to another character’s clothes as “nighted color?” Are there definitely trees in this scene? As you read through the play with your students, underline these clues and decide if they’re necessary to telling this story. If they are, brainstorm together on how these can be represented for the performance. The thing to remember most is does this tell the story? The audience has a great capacity for imagination, and if you gesture with a wooden dagger and proclaim that it is dangerous then they will believe you! Are you planning a performance of a Shakespeare play this year? What will you be performing? With just a few weeks before Thanksgiving, I thought that I’d do a quick internet search to see what I could find when I entered “Shakespeare and Thanksgiving” into the search box. Wow! An incredible number of resources popped up on my screen. The American Shakespeare Center has a page of responses sent in by friends of their Facebook page that make up their “Top Ten” favorite things to say at Thanksgiving, including references to The Taming of the Shrew, The Merry Wives of Windsor, Othello, The Tempest, Antony and Cleopatra, Much Ado About Nothing and Twelfth Night. It’s great fun to read them. You should check them out. And, while I expected to find some quotes, I didn’t expect to find that I could even purchase a Winsch postcard that contains a quote from Shakespeare, “Now, good digestion wait on appetite/And health on both” (Macbeth, 3.4.43-4). If I created my own “Top Ten” list of my favorite references to Shakespeare and Thanksgiving, the one I found on JibJab.com would rank at the top. It is just hilarious. I suspect, however, that we could create a “Top Ten” list of our own, so readers, what’s your favorite reference to Shakespeare and Thanksgiving that you’ve found on the internet? Shakespeare’s England was not overseen by a democratic government. Monarchs ruled for life, and successors were chosen based on royal bloodlines or who won which war. Despite this, Shakespeare knew that the public’s perception of a monarch went a long way towards the success of their reign. He gave his characters the power of language to persuade and control others. Many of his characters are gifted rhetoricians – they use language and the power of their words to bring other people around to their side. Mark Antony – uses the power of rhetoric to turn a huge Roman mob against Brutus and Cassius. 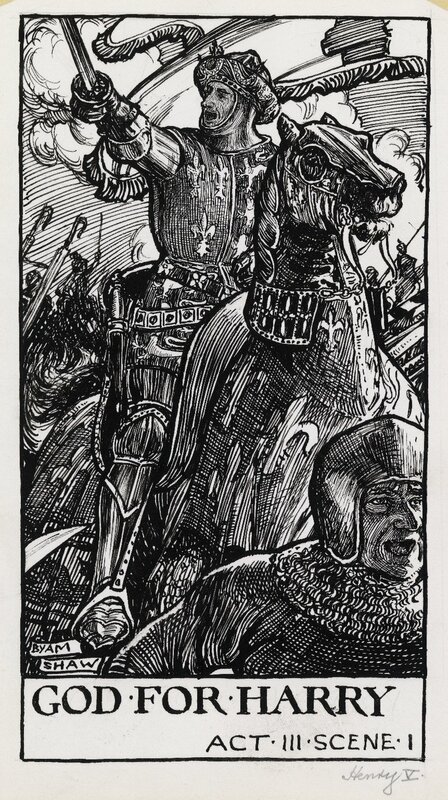 Henry V – uses the power of speech to boost his small English army’s morale as they seige France’s much larger forces. Richard III – uses the power of words to manipulate his court and to become king. 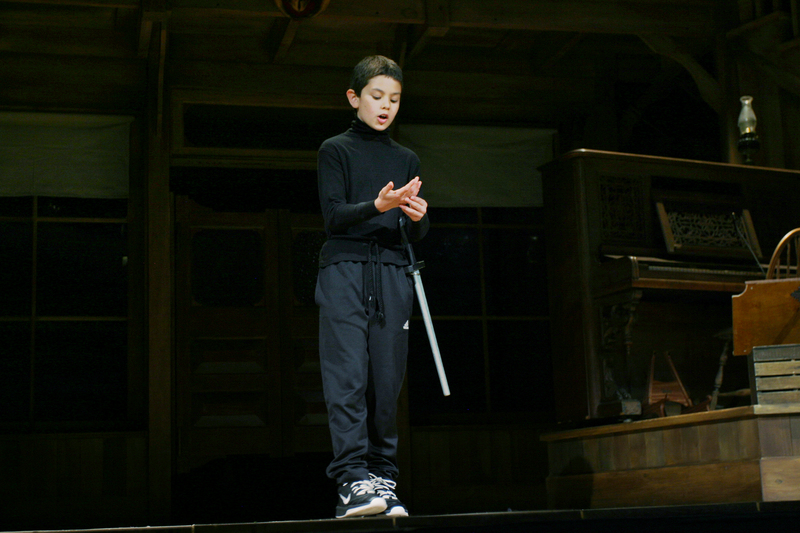 Iago – uses the power of language to manipulate Othello’s view of his wife and lieutenant Cassio. Hamlet – uses the power of words to turn right and wrong actions around in his head until he decides what to do. It’s interesting to see, too, how the Roman elections look in Shakespeare’s plays. Brother is pitted against brother in Act 1 Scene 1 of Titus Andronicus to win the seat of emperor Coriolanus spends the first half of his play looking to win the popular vote after proving himself in war, and the people’s vote elects the Triumvirate of Marc Antony, Octavius, and Lepidus in the war against Brutus and Cassius following Julius Caesar’s death. We’ve been sharing lesson plans on the power of persuasive speech on our shiny new Facebook Page today to explore these characters’ impact on popular and singular opinion. As a democratic nation, today eligible voters are using their individual voices to collectively elect the nation’s leader for the next four years. Were we won by words, words, words? How do our nation’s leaders compare to Shakespeare’s (both historical and literary)? Comment below, or Like us on Facebook to tell us more! Folger Education is proud to announce that we have branched into our own Facebook Page this week! Over the past year or so, different divisions of the Folger have been branching from the parent Folger Library page to give more specific information of interest to their audience. Maybe you’ve already Liked all of the Folger pages forTheatre, Poetry, and Consort, so add us to the list! Like us to get updates as we share our favorite new and classic resources for teachers, and keep you informed of professional development opportunities from us! We’ll be available to respond to posts from you if you have any questions or comments about particular links, resources, or programs! Share the page with your friends and coordinate with your community electronically to bring Folger Education even closer to you! If you can’t tell, I’m pretty excited about this development, and really do look forward to interacting with you in a new medium. I’d love to hear from you!